A dash of ginger, a splash of garlic, a nip of salt – to watch Chee Keong Look is to watch a master at work. 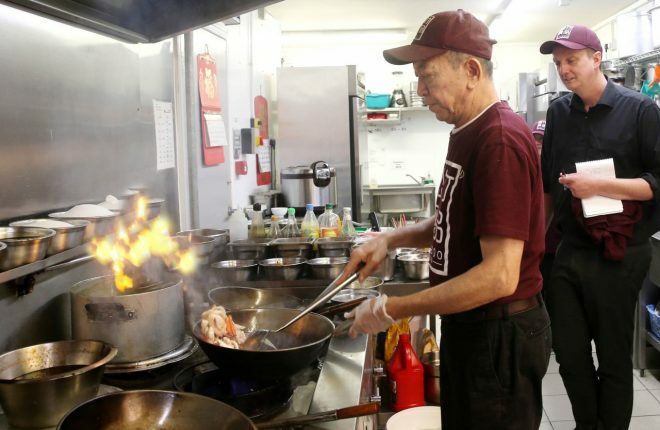 Standing in front of multiple woks he controls his kitchen like a conductor addresses an orchestra. Where can this culinary Andre Rieu be found? Catering to wealthy diners in a high end Barcelona eatery? Entertaining tourists in a trendy Parisien restaurant? He can be found in Donegal. In Bamboo Court just off Letterkenny’s Station Roundabout to be more precise. From the Malaysian city of Ipoh, Chee Keong Look has honed his skills in kitchens all over the world. A master at work…Bamboo Court chef Chee Keong Look as the Donegal News’s Conor Sharkey watches on. Twelve years ago, and after a decade in America, he made the brave decision to bring his family to Dublin. There he worked as a head chef in the four star Maldron Hotel before trading the capital for Donegal. After accepting a job in Carrigart’s Shanghai Palace, Chef Look eventually took over the premises. He recently sold the Shangai to concentrate on a second business he opened six years ago, Bamboo Court. For several years Bamboo was run as a traditional Asian restaurant, serving dishes from across the vast continent. Following Mr Look’s decision to step back from the business side of things, the baton has passed to his daughters, 23-year-old Wai Yee ‘Abbie’ Look and 26-year-old Cindy Yee Look. 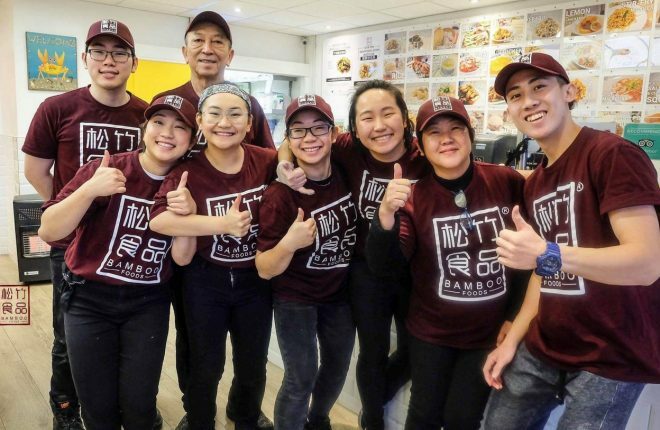 While Chee Keong and his wife, Yoon Yin Chin, remain central to the day-to-day running of Bamboo, Abbie and Cindy have wasted no time in making their unique mark on the popular food outlet. From the more traditional stylings of their parents, the girls have transformed Bamboo Court into a fresh, trendy restaurant and takeaway. Evidence of that younger touch has been the introduction of a Just Eat delivery service. Very much a 21st century phenomenon, the idea behind Just Eat is that diners can order their food online. Or as the advertising Gods tell us, “at the touch of a button”. Another component of the Just Eat idea has been their annual awards. Simply put, Just Eat asks the public to log on and vote for their favourite local takeaways and restaurants. 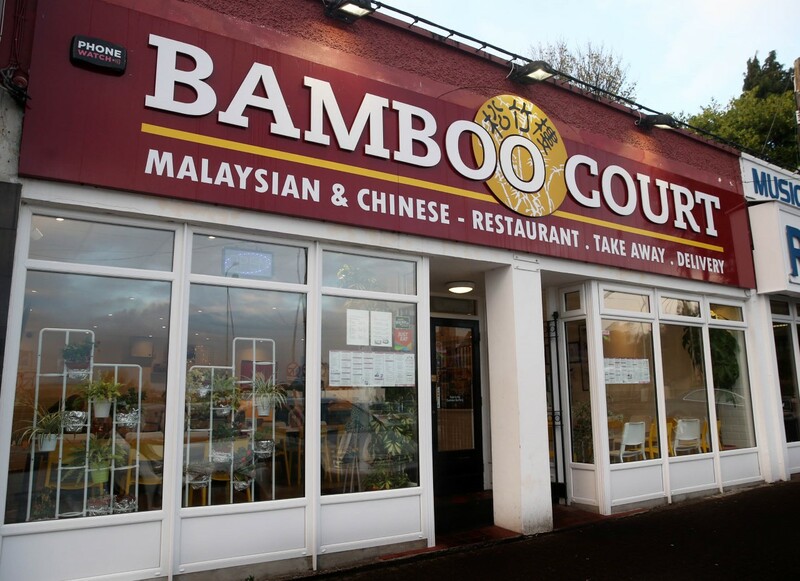 Recently hungry Donegal voters took to the internet to tell the judges that when it comes to Chinese food, Bamboo Court’s is the best in Ireland. As if one gong was not enough, customers also placed Bamboo’s spice bag as Ireland’s number one. The spice bag has developed something of a cult following in Ireland in recent times, a popularity that has yet to spread across the border to the North. For those less educated in the ways of the Bamboo Court spice bag, it pretty much does what it suggests – it’s chips and chicken topped off with variety of spices, fried garlic and other ingredients. Chee Keong Look can cook. Of course he can, he has been doing it since he was 13-years-old. But beating off competition from restaurants in Dublin, Galway, Wexford takes more than food. A smile costs nothing but means everything. And that is the first thing that strikes you when you walk into Bamboo. Not the décor, not the spicy aroma, but the fact that the staff seem genuinely happy to see you. On hand with a greeting on Wednesday were Abbie, Cindy and their sisters Joey and Jia Yee. They form half of the eight strong Bamboo team who, daily, tend to the needs of Donegal’s foodies. 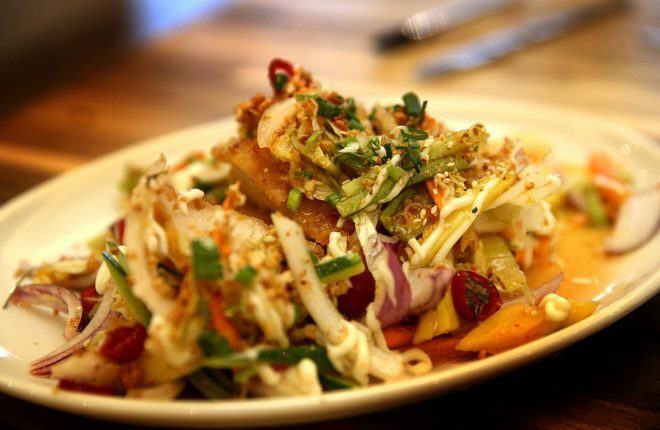 From their Thai Kerabu crispy chicken to Mr Look’s signature dish, his Mongolian stir fry, to more common orders like chicken curry and stir fry noodles, Bamboo Court is pretty much a food lover’s heaven. And Abbie and Cindy have plans. Plans for the future, plans for expansion. “It is something we have talked about and we are looking at locations,” explains Abbie. Running a restaurant, a busy takeaway service and a Just Eat facility means things are busy. Extremely busy in fact. But how, in a town like Letterkenny where there are coffee houses, cafes, burrito bars and restaurants on just about every corner, do you stay ahead of the competition? Customer service is key. Meeting, greeting and making sure customers are well catered for is vital to Bamboo’s success. Using local suppliers is important too and where possible the Look family buy their meats and vegetables in Donegal, from companies like Doherty’s Fresh Food Shop in Letterkenny. For more exotic flavours they do have to reach beyond the county’s confines but generally, it is all about shopping local. Thai crispy chicken. set your tastebuds to stunned. For such a young team, Abbie and Cindy have impressive business acumen. Their parents taught them well. In another nice touch, one of many on our all-too-brief visit on Wednesday, myself and photographer Declan were handed a fortune cookie before we left. Mine read ‘Something good will happen to you before Friday’. It already had, I had discovered one of the finest little Asian restaurants in all of Ireland. Try Bamboo Court. Try their award-winning spice bag. Try their Mongolian stir fry chicken. Try the Malaysian papa curry. Try it all.